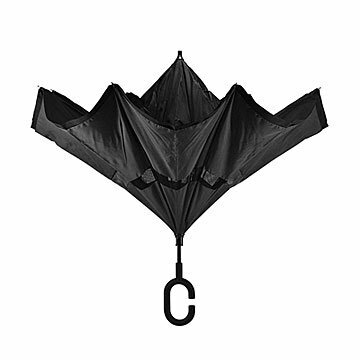 Rainstorms beware: This inverse design folds upward to keep droplets off you and your things. Outside our Brooklyn office, rain poured so heavily you couldn't even see the Manhattan skyline. It was a storm that called for a superior umbrella—not a dinky drugstore buy—and this inverse design stood up to the deluge. What we loved: It's wind-resistant and has great coverage, but is still lightweight. By folding upward, the drops stay contained inside rather than splashing you or the inside of your car. Umbrella bags are not needed, and the sleek structure stands up on its own to dry. Basically it's the rainy day sidekick of your dreams. Made in China. I will by several more for all my daughters. My wife has a fairly long walk at work. She loves it. Purchased this a gift for someone who doesn't want or need anything. However they are very frugal and would never buy anything but the most basic umbrella. I though they would appreciate the functionality of this umbrella. I think that it is sturdy, the price was right and I good for use in the rain.